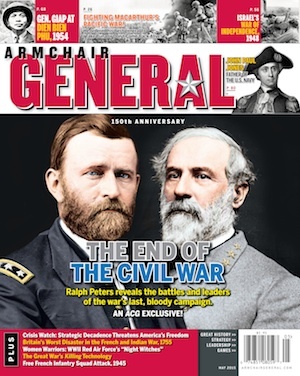 Maj. Gen. Adna R. Chaffee, Jr. – ‘Father of U.S. Armored Forces’ | Armchair General Magazine - We Put YOU in Command! Hailed as the Father of the U.S. Armored Forces, Major General Adna R. Chaffee, Jr. was one of the most influential military leaders during the interwar war period. Although a cavalry officer, he envisioned an independent, fast-striking mechanized/armored force, which became the modern-day US Armor branch. Chaffee held key positions, which were influential in the development of mechanized/armored vehicles and doctrine. His leadership, expertise in organizational maneuvers, and command of doctrine allowed him to highlight armor’s potential in two highly visible mechanized maneuvers. Additionally, Chaffee was able to clearly articulate his mechanized/armored vision to the interwar period military leaders and to a Congressional audience; a greater interest armor development and tactics resulted, breaking the existing inertia regarding armor. General Chaffee’s professional foresight, knowledge, and leadership during the interwar period paved the way for the Army to adapt a radical change and invest in the mechanized/armored force as a combined arms approach to warfare. "The First World War ended in to the rumble of British and French tanks clawing their way through the mud of France and Belgium in November 1918. The Second World War began with the clatter of German tank tracks moving rapidly across the Plains of Poland in September 1939. "—John T Broom, The Commander’s Vision in Blue and Grey: The Roles of Adna R. Chaffee, Jr., James H. Wilson and The American Civil War in The Development of American Armor Doctrine. After the First World War, the British and the French were the world’s authorities in tank development and armored doctrine; however, the Germans within twenty years achieved parity in tank development and supremacy in armor doctrine and tactics. The United States during the First World War and the interwar period lagged behind the European powers in both tank development and armored doctrine due to fiscal shortcomings and traditional conservative military leadership. During this period, Chaffee was able to resurrect a failed mechanized concept and application and became a dominant mechanized/armor advocate in a time of budget constraints and conservatism. General Chaffee, Jr. was born into a famous cavalry family. His father was Major General Adna R. Chaffee, Sr. A young Adna R. Chaffee, Jr’s saw his highly decorated father participate in numerous campaigns and command several units. It was during this time that young Adna was exposed to excellent leadership and devotion to the Army. Chaffee, Jr. was a West Point cadet from 1902 to 1906 and subsequently commissioned as a cavalry second lieutenant in 1906. "Chaffee was widely respected within the Army as both a horseman and as a intelligent and thoughtful officer." In 1927, Chaffee was the Army Staff G-3 Plans officer where he became more familiar with mechanization and all mechanized equipment and tests. At that time, he began to understand the need for armor on the battlefield. In 1931, Chaffee, now a lieutenant colonel, was assigned as the first commander of the newly formed 1st Cavalry (Mechanized) Regiment at Fort Knox, Kentucky. He later took command of the 1st Cavalry in 1934, doing much to establish, train, and organize the army’s first dedicated mechanized/armored unit. Of even greater importance was Chaffee’s contribution to the development of the basic doctrine of mechanized warfare. Chaffee was largely responsible for the shift from defensively oriented doctrine to an aggressive and combined arms oriented doctrine, which is still employed today. Later in 1934, Chaffee was transferred to the Army Staff as the Budget and Legislative Coordinator, where he served until 1938. This position allowed Chaffee to influence the growth and funding of a mechanized force and to influence a more aggressive, offensive-oriented doctrinal development. Chaffee’s position was essential to the survivability and independence of the mechanized/armored force, since both the cavalry and infantry branches wanted to control all mechanized/armored vehicles. While on the Army Staff, Chaffee continued his pursuit of drafting mechanized/armored doctrine. Chaffee’s next position of influence provided the opportunity that allowed him to prove mechanized/armored vehicles needed to be an independent force with its own doctrine. November 1, 1938, Chaffee took command of the 7th Cavalry Brigade (Mechanized). As the commander of the 7th Cavalry, he was invited to participate in two high-visibility mechanized maneuvers. In the late summer of 1939, he took his brigade to participate in the Plattsburg, New York, maneuvers and in the Louisiana maneuvers in the late summer of 1940. The New York maneuvers afforded Chaffee the opportunity to participate in a series of exhibitions and demonstrations just before the start of the maneuvers that would further advance his argument for the need for an independent mechanized branch. The New York maneuvers highlighted Chaffee’s vision and doctrinal influence of a fast-moving, aggressive force. His leadership as the Blue Force commander against the Black Force was so aggressive and effective that the umpires had to terminate the exercise early because of the 7th Cavalry’s rapid maneuvering, quick change of direction and swift strikes deep in the enemy force’s rear area, which paralyzed the Black Force command’s ability to react. Chaffee employed a combined-arms attack, while the Black Force used armor as defensive assets and sliced vehicles off to each infantry unit. Although there was much success, Chaffee identified a couple major deficiencies within the 7th Cavalry’s maneuvers. He lacked a dismountable force to provide security and an organic engineer troop. By the time 7th Cavalry participated in the Louisiana maneuvers, Chaffee had corrected the New York deficiencies. The Louisiana maneuvers were broken into two phases: in the first phase Chaffee was the commander during several exercises, whereas the second phase combined the Infantry Tanks Brigade with the 7th Cavalry Brigade. The two brigades only had 48 hours to reorganize and prepare for an attack 75 miles away (Mildred H. Gillie, Forging the Thunderbolt: A History of the Development of the Armored Force). The combined force successfully penetrated the defensive lines against a well-prepared defensive force. The combined force had begun exploiting the breached defensive lines when the exercise culminated. The Louisiana Maneuvers were successful tactically, which proved Chaffee’s vision to be correct. However, it was after the maneuvers that Chaffee had his greatest influence on an independent armored force. Chaffee had multiple opportunities to share his vision and influence the Army’s need for an independent armor branch. Immediately following the Louisiana Maneuvers, a group of senior officers including Chaffee, met at a school in Alexandria, Louisiana, to discuss the maneuver successes and the future of armor. Among the group of senior officers were two important generals: Brigadier General George Patton, who umpired the exercise, and Brigadier General Frank Andrews from the War Department Staff, Assistant to the Chief-of-Staff, G-3. Of note, the Chief-of-Infantry and Chief-of-Cavalry were not invited. The group of senior officers determined that there needed to be a separate and independent branch to shape doctrine and control armored vehicles. Chaffee was clearly on his way to implementing his vision. With these words, Chaffee solidified the argument against the cavalry and infantry branches and helped set in motion what would become the Armored Force. Just one month later, on July 10, 1940, the War Department issued an official directive creating the first Armored Force with Chaffee as the commander. Chaffee and his supporters fell short of a legal branch, but years later armor would eventually become its own branch. The Armored Force organizational structure followed the recommendations Chaffee had given to General Andrews during the meeting after the Louisiana Maneuvers. In May 1941, Chaffee prepared a statement for the House of Representatives, Chairman of the Sub-Committee on Appropriations, in order to address the Armored Force’s combined-arms capabilities and some significant recommendations for the future of the Armored Force. Although he was never able to appear before Congress because of his untimely death, his statements were read to Congress on August 22, 1941—just three days after his death. The statement was so profound that it laid out the blueprint for armor success for years to come. Major General Chaffee’s professional foresight, organizational knowledge, and military leadership during the interwar period paved the way for the Army to adapt a radical change and invest in the armored vehicle as a combined-arms approach to warfare. Chaffee was the single most influential military leader in regards to the creation to completion of the Armored Force. His contributions were unmatched, and because of his untimely death the Armored Force may not have seen Chaffee’s full potential. Chaffee was a visionary who advocated the formation of an armored force during the interwar period. Ultimately, he convinced the Army leadership and Congress to adopt his vision and create what is now the Armor Branch. Ray Porter is a Special Forces Major currently attending the Army’s Command and General Staff College located at Ft. Leavenworth, Kan. This article is a modified version of a paper prepared for the C&GSC. After enlisting in the Army in 1986, Porter was assigned to 1st Ranger Battalion, 75th Ranger Regiment and in 1997 to 7th Special Forces Group. Graduating OCS in May 2001, he was assigned to the 82nd Airborne Division as a Infantry officer and became a Special Forces Officer assigned to 5th Special Forces Group in 2005. His combat deployments include 2002 Afghanistan; 2006 Taji, Iraq; 2008, Mosul, Iraq; and 2009 Bahgdad, Iraq.. He offers a bibliography below for those who would like to learn more about Major General Adna R. Chaffee, Jr., and the development of America’s armored force. Cary, James. Tanks and Armor in Modern Warfare. Franklin Watts, Inc., 1966. Chaffee, Adna R., Jr. Mechanization in the Army. General Staff, 1931. Chaffee, Adna R., Jr. "Mechanized Cavalry." Lecture delivered at the Army War College, 1939. Chaffee, Adna R., Jr. Statement of Major General Adna R. Chaffee Jr. Delivered to the Sub-Committee of the Committee on Appropriations, 1941. Gillie, Mildred H. Forging the Thunderbolt: A History of the Development of the Armored Force. The Military Service Publishing Company, 1947. Mackey, Kenneth. The Tank Pioneers. *Finally,* someone has given General Chaffee his due. Major Porter is to be commended on his fine article. The ‘What-Ifs?’ boggle the mind. What would Chaffee had done if he was still alive during WW2? Would he have sat at a desk at the Pentagon, or gone to Europe instead of or over Patton? Has the makings of a good ‘Alternate History – WW2’ book. I live in the house that Adna Chaffee grew up in & after his retirement he came back to. He was the founder of our town, (Orwell Ohio) What’s left of his homestead is a 50 acre farm. I need to do more research on this remarkable man.